Hello traders, welcome back to the Trading Depth project. We are excited both for the 10th episode and the trading star FT71 or Futures Trader 71, a nickname Morad Askar has had for 15 years now. 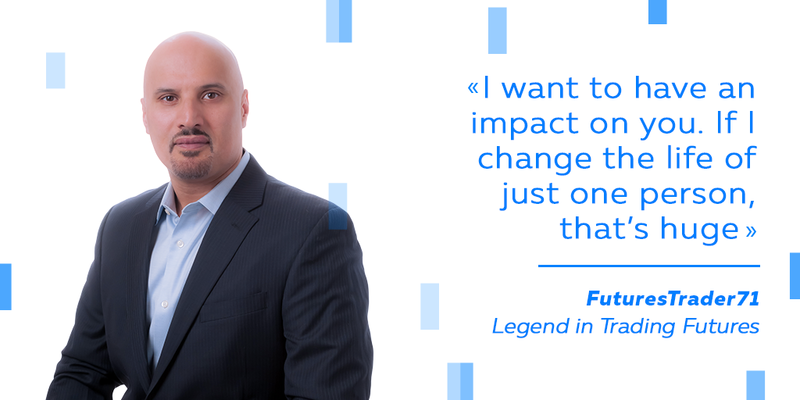 Morad started as a high-volume equities trader and then transferred to futures at the Chicago Border Trade about 16 years ago and never looked back for equities, except for investment. His cumulative experience is 18 years now. Morad is a known pioneer in the use of volume profiling, order flow, and high-speed intraday scalping. All at the pre-HFT times. He watches for tradable statistical patterns to follow the auctions. 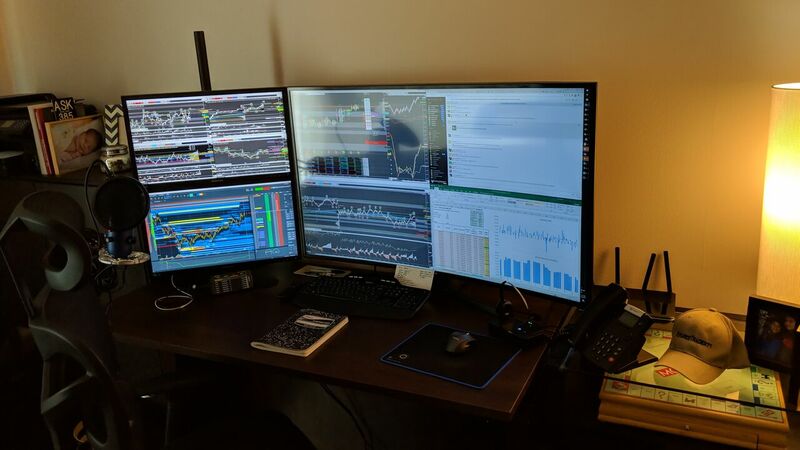 FT71 has always traded in a professional proprietary trading environment and ran his own shop until 2010 when he decided to direct his attention to online traders. He has made trader performance and risk metrics a cornerstone of his prop shop and trading. Once Morad came online in 2008, he started tweeting. FT71 also assisted with establishing Stage 5 Trading Corp which is a unique futures brokerage focused on bringing a prop trading approach and tools to online traders. Today his focus is on the community entitled Convergent Trading. Morad, you are a well-recognized and respected trader in the community and seem to be busy with interviews and invites to various events. How do you manage your time and how much of it do you devote for trading futures? So, time management is definitely not my strongest skill. Thankfully, trading is. But, the best way to manage this thing, I’ve learned over the course of the years, is to just say “no”. So, generally, I don’t accept every request that I get. There are certain partners that I believe are doing things for traders that are in line with what my goals are, and those are the ones that I prioritize. Bookmap is one of those. You know, the product was created and I was involved from very early on, the team has been very responsive. When I see something that needs to change or need to be fixed or whatever. Bookmap has been responsive, so it is always easier for me to say “yes” to doing something for Bookmap. But currently, there is a lot going on. I mean, between just keeping active as a trader as opposed to becoming an educator, which I prefer not to be. 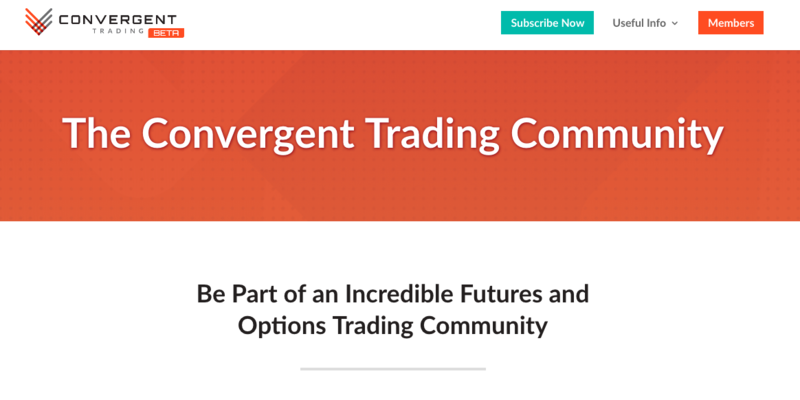 I have to focus on what the market is doing and dealing with day-to-day changes, but also, I launched Convergent Trading on March 14th of this year. It’s just myself and one other person handling everything from administration to over 400 members to just many aspects, so it’s really long days and long hours. In addition to that, I have a new daughter, born on March 1st. Thanks. It’s been a pretty insane year. It just seems like a lot of work and progress is slow. So, to answer this question, I have to say that the best way to manage time is to figure out what you don’t wanna spend time on and allocate the rest. What are your ideas on changes in trading, trading psychology and in general? The thing with trading, that is actually comforting, is that although you have to keep evolving, and changing, and growing with the market, in general, there is nothing new under the sun. I am just being honest with you here. I have incorporated some tools and things that I hadn’t used in a long time, that I’ve been using quite a bit lately, which I always execute on Bookmap rather than on a trading platform. I do this for at least 3, maybe 4 years now. I am also incorporating the footprint called VolumeScope on the software that I use. I use Investor/RT for that. It’s something I hadn’t used in like 9 years, and I’m back to using it to determine the areas which the market be really badly priced. In fact, I’d used the Volume profile since before it became a popular tool, because Market profile didn’t make much sense to me, splitting the market into time. So, I moved to Volume profile which shows you, by the shape of the profile, how much volume is occurring in each price. It shows you where price is being accepted versus where price is being rejected. That’s fine. On Bookmap, that shows up as big dots, small dots, quick areas, collisions, things like that. But, the one thing that I’ve started incorporating is looking at the footprint, looking at what each price on the bar is trading, where there is a fight taking place, how is that fight progressing, things like that. It’s kind of like putting the price action under a microscope. So, that is really the biggest change. As far as psychology, I can tell you from 18 years of doing this and having backed people for 15-16 out of those 18 years, it’s the same, it’s constantly the same. The issue that we all fight, that we do not accept as traders, as human beings in general, is uncertainty. So, we build a lot of tools, we build a lot of studies, and we put moving averages, and we put Fibonacci, retracements, extensions, we use geometry, and we use moon cycles, and we throw darts on the board, and we do all kinds of things as human beings. We have a hard time with the idea that there is no way to predict whether the next trade will work or not. And that is the trading psychology, the clutch. How has your portfolio changed over time? You mentioned that traders must treat it as a business. I’m trading the same products. I don’t trade as actively as I used to. Over the years, I’ve changed quite a bit. I mean, I went from being basically a scalper on X-Trader, doing a lot of volume in futures. I started out trading equities in high volume on NASDAQ, and we were just market makers, just taking advantage of level 2 data, how its institutions were positioning for their portfolios and there was a lot of money to be made till that came to an end back in 2002. 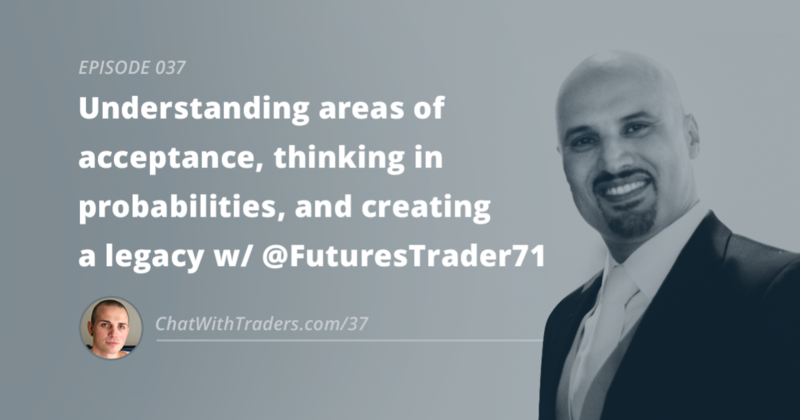 Key Elements of Successful Trading with Morad Askar. Then I switched to futures, and then the same thing but in futures, high volume. A typical day back then was somewhere around 600 round turns or 3200 contracts traded a day up to about 3000 round turns or 6000 contracts per day. So, it’s a lot of orders, a lot of fills, huge volume. That’s what I learned when I first switched, and that’s what I did. I did that till 2005 when HFT and co-located algo started taking this space, and it became more and more difficult to get the fills I need to make it worthwhile for the risk. It just seemed like computers were doing it much faster. I knew that my trading and myself needed to change. I devoted a good portion of 2005 and 2006 to test a lot of things. This was when I first came online and started looking around what everybody else was doing, and I found that information online was very poor. There was a lot of misinformation, poor concepts shared by people who were considered gurus, and the space that was my first exposure to the online market. At that point, I settled on using market profiling, and because I was using CQG integrated client, paying a lot of money for it, and that was the first software that had market profile, it also had volume on it that nobody looked at. I started to look at volume, because the volume, just like it does on Bookmap, is based on tech data, and that was really accurate and very fast. To me, it just made no sense to look up market profile. So I looked the volume at each price. And I looked at volume as energy. The more volume at a certain price, the more energy that price has. And, at some point, that energy dissipates, and so on. I switched from active trading to doing small sized scalps and building or reducing positions to more of a structured environment. That took a long time to adapt because I had the instinct to get out or get in quickly, and now training myself to wait for my stop, or wait for my target. to come to me. Like at a train station. That took almost 9 months, and now I’m trading 20-30 trades a day. The volatility is still there, so there is a lot of opportunities to make mistakes, to recover. However, as the time went on, and I got involved with other things, like creating trading systems, my volume has gone down and now I trade more deliberately, which is more comfortable for me. Besides, I’m older, and I don’t wanna be in a lot of trades all the time. I’m sitting and waiting for my train to arrive. Is this my train? No? Ok, let it pass. Oh, this is my train, I hop on, but it may or may not get to my destination. But that is what drives traders into the market, right? You may be lucky and win, or not. It’s the excitement. Exactly. But, most traders think that, well, I’ve been doing this for 18 years, and I’ve struggled throughout those 18 years, especially at the beginning when I was doing equities, again when I switched to futures in 2003. Those periods of struggle have become rather the times when I’m just trading with sweat dripping down my nose or whatever, the periods when I recognize them as a time when the market is changing and I need to change slightly in terms of how I’m seeing things, because the market operates in cycles, just as human beings operate in cycles. For us, as humans, it’s been really hard to relate to the fact that I can see the exact same setup today as I did yesterday. Maybe even, rarely, but maybe even at the exact same price. Exactly everything looks the same. But yesterday I went longer and lost money, so I should’ve been short. Today I get short and I might lose money again because now it’s going the other way. How do I prevent this? How do I change it? And the fact is you cannot. You cannot affect the outcome in any way, because the market is too big for most people to influence the outcome. Now, if you are a president with a Twitter account you can influence the outcome pretty easily. Or if you have friends who can give you the FOMC (The Federal Open Market Committee) release or the Labor Department release, or whatever. But if you are trading on the same level field, which is why futures has been the market for me, where everybody is really operating on the same information, at the same exchange, the goal is to last as long as possible, knowing that you have an edge. But this is a huge problem for traders. I’ve spent a lot of time and money getting traders past this when I’m backing them. So, if I put up $25,000 for every trader that I backed, probably the first $18,000 to $22,000 are spent getting a trader to accept the uncertainty. And the best example of this that I like to use is the coin flip, meaning most traders will trade like they are flipping a coin. If you said, “Ok, you can flip a coin, you can choose as many dollars as you want out of a $1000 to bet on each flip”, and what many traders will say is, “Ok, I’ll bet really small, I’ll bet $5 for the first three flips. Oh, the first three flips were heads, three heads in a row. So, now I’m gonna bet $500 out of a $1,000 that the next flip is tails, because how can a coin be fair if the fourth flip is not the opposite. The probability of four heads in a row is so small, so I’m gonna bet $500 because I wanna win big”. Right? That’s because they think they have these statistics in their mind that the probability of the fourth heads in a row is so small that they should bet really big to get the money they invested in the first three flips plus make a lot of money. Well, the truth is this forth flip has a 50/50 chance still. It will always do. It never fudges. If there is a win/loss chance, it will always be 50/50. If there are three outcomes, it’s 33% for each outcome and that is how it works every single time. Traders have a hard time with this, because they are like, “How do you make money on a 50/50 chance”. But, if you have an edge, in other words, you have a certain way of organizing market information and then responding to a slight edge, it doesn’t have to be big, 57% over a large sample size is enough, if you bet on that a thousand of times, then you are lucky to get as close to that testing edge as possible. There is one your quote “Let the subconscious deal with the action when the time comes”. What is the role of subconsciousness for you in trading? Do believe you can train your subconsciousness in some way? There are stages of competence with human learning, you probably know about that. You know how to drive, you are nervous, you are thinking about everything you are doing, you are thinking where you put your feet, where your hands are, you are checking the mirror too often, you are staring at the front of the car instead of the horizon. You have to constantly remember to check your speed, you can’t have a conversation, you can’t be shaving or eating your McDonald’s while you drive when you first learn. That is the stage 1 where you have to learn very mechanically what you have to do, and you have no idea what the ultimate skill set will be. You have no idea what it is like to be an expert driver. You think you are getting there, but you have no idea how much responsibility there is and what are the dynamics, the physics of driving, the laws and everything else. But, I bet that if you drive, you don’t sit there and think, “Is my seat in the exact right angle? Is my mirror? Am I driving exactly the right speed?” No. You drive, you look around, you are not even thinking about how often you are checking the mirror, how soon you should turn the wheel, or if you are going too fast, etc. You are not even thinking about these things. They are just happening. While they are happening, you are eating a sandwich, shaving, or messing with your radio, or whatever. It’s completely subconscious. That is stage 4. As a trader, the skill set becomes that way. Some of the greatest traders I’ve been around could not tell me what they were doing. These guys were making and losing almost a $100,000 a day. Tens of thousands of dollars per trade being bet. Huge bomb traders, 300-400 lot bonds. [A round lot typically represents $100,000 (of face value) worth of bonds.] And they could not tell me what they were doing. Their answer is, “Look at it, it is not gonna go up, it’s obvious, so that is why I’m short”. Actually, there is so much information that they are incorporating, but not actually thinking about it, because they’ve shifted it to the subconscious mind. The stage 4 is kind of like from a baby learning to walk and falling every few seconds, to a baby learning to walk holding on to something, to you being able to get up and walk without even thinking about it. So, that is the subconscious part. What is the ratio between the time you spend on mentoring and trading? I don’t actually do mentoring. What I’m focused on is creating with Convergent Trading. Creating the same environment I used in my prop shop in Chicago here, at the Board of Trade, where traders come in and there is no noise or nonsense, and everybody is focused on just talking about the market and continuing to learn and expand, and us learning from each other. The reason I am where I am is that I had the opportunity to trade professionally from day one. I was never a trader at home. I would’ve lost a lot of time and money doing that. I was always in a professional environment. All I am doing for Convergent is offering that in a virtual environment, so anybody can join and be a part of it. And sometimes it’s not a fit for people, because they are not ready for it. For me, as I am running a business and several other things I wish I wasn’t, what I do is I focus on the first two hours of trading and the last hour. I have audio alerts on Bookmap, as well as other software that tells me when things are going on, like crude oil dropping right now, or just dropped 60 cents, so that gets my attention. But I find that trading from the European time, which is 10:30 Chicago, 11:30 EST all the way to about the last hour of the pit session is not particularly profitable, and even it were, it is not a good return on my time. If I’m trading, I’m trading smaller, and I’m not really getting that much for my effort. So, really, three hours a day. What would I recommend for a new trader? I would recommend you start when the treasury opens, so when you trade US markets start at 7 AM CST, or 8 AM EST, and stick around till about half hour after the European close and then come back for the last hour. Stop trading, but don’t leave during that lunch hour. Spend it doing your performance analysis, doing your journal for each trade. You should be journaling every trade, to keep the track record, driving into your head the subconscious learning that comes from having to do something repeatedly. I took the 10,000 hours thing, read several books about it, but in trading it’s 10,000 trades minimum to get to the point where you are comfortable. Once you said that you meditate. Tell us more: how and why are you doing it? How do you restrain yourself from emotional decisions? Meditation changed my life, and I know it has many people. I mean, Ray Dalio, the founder of the largest hedge fund in the US, is a mediator as well. He uses the same technique as I do. I did not know that till recently. However, does not matter what kind of meditation it is, the benefit of it is the quietness of your mind. When I started to meditate my personality changed. I became a lot calmer, started feeling a lot more energy, a lot more focus. It was such a huge impact on me that all of my traders, as a requirement of employment, had to learn to meditate. All the traders had to go and learn because the performance on a mental level between a meditator and a non-meditator is very different in my opinion. Meditation, not having that noise, means that you are much more focused, your mind is much clearer, and there is no fog there. Ultimately, you are able to focus on what is important and let go of what’s not, because the practice of meditation is just closing your eyes, using some technique to quiet your mind. As you are meditating, you are dealing with the conversation that we all have with ourselves. You learn to be in control of what you react to, which is a skill everybody needs, whether it’s in trading, or with your spouse, partner, whatever. We learn through meditation that things happen, life happens, bad trades happen. How I respond to them is under my control. The meditation I learned is called transcendental meditation, or TM. You could learn more about it at tm.org but I’m going to tell you that I don’t recommend it. It has become so popular and so expensive and kind of exclusive that it’s not really all that. I hate saying that, but it’s the truth. I would learn to meditate from anybody who focuses on meditation. For example, you can find really good meditations from a person named Jon Kabat-Zinn. He offers really good meditation courses. There is another one called Tara Brach, she has a really good course. There is also an app called Calm, and you can do the 7-day course. However, all of this requires consistency. Doing this with a teacher is much better because it helps us stay focused and not make excuses not following the program. Although, some people might do it successfully on their own. How often do I meditate? Minimum meditation required is 20 minutes twice a day. So, you wake up and you meditate, before eating, exercising, before anything else. You meditate for 20 minutes and lay down for 3 minutes with your eyes closed. You might fall asleep if you are really exhausted, but it’s ok. And then I also meditate for 20 minutes in the afternoon. Now, I learned some advanced meditations that take an hour, but I don’t think that’s necessary. For an average person, it will take 6 weeks of 20 minutes of meditation twice a day to start seeing the results of this mental acuity and mental clarity. You also mentioned that you don’t use stops but use mental stops. Was it based on your early experience? In this regard, could you share some of the biggest unfavorable trades and lessons you learned from them? Yes, I don’t use hard stops. And I’m not recommending it to someone who is not disciplined or is struggling with consistency. I’m not recommending that you do this. It’s risky not to use stops. However, here is the issue. If I trigger a bracket order and it automatically puts my target and my stop out. What that inevitably does is it causes me to watch the market versus my stop. That is the outcome I want to resist. So, I basically sit there and stare if it gets my stop or it gets my target. What is much more important to me, is to be active with the market, even if I’m not there with the trade, I prefer to be active and to continuously read what the market is doing. You can read this in a book The Chimp Paradox, but the function of our brain changes when there is a threat. So, our brain is most keen when we are in action. If I use stop, I let it go and it does what it does, but if I don’t, I’m watching very carefully, and I start to observe little things, little clues, cause I’m actively watching. I’m still gonna take my stop because I’ve learned the hard way, it still makes me more active to watch how the market is gonna take out my stop. It is a clue for me as opposed to what normally happens if I put a stop there, which is no big deal. I prefer to stay engaged and stay on edge all the way through the trade. Stop feels like insurance and it feels like I can be passive, and I don’t like becoming passive. So, I don’t use stops. But, if you are not gonna use stops, you have to make sure you have a really good infrastructure, good internet setup, good software so that you are not getting disconnected with no stop in the market. And, at a minimum, you should use a disaster stop, a big stop, like 10 points or something, but still be actively managing the trade just in case the technology goes down, and you will have protection on the market. Be safe, the risk is the first thing. But, me personally, I don’t use stops. In one of the webinars, you compared yourself to the Super Villain Lex Luthor. Is it just a joke, or you like this antihero and have some of his character traits? I don’t remember comparing myself to him. Other than the same bold hairstyle. I don’t know, he seems like a smart guy, probably smarter than me, but I don’t know enough about him. Before trading, you were an engineer. Does this background help in trading? Yes, it did, but, obviously, it is not necessary to be an engineer. It helped me in the way I look at things. I’ve always loved physics, I look at the market as energy, just like everything it is made out of energy. The thing that I took from engineering is confidence. I know that I can figure things out. Give me a problem and a will find a solution to it at some point. Another thing is that I see the price as an advertisement. It’s shouting to you, saying, “How about now? How about this price?”. And then, I see volume as energy. So, if you ever studied vectors, they require two things: direction and magnitude (energy). So you don’t care about fundamentals in this regard? I mean, I pay attention to things that are happening politically, I look at earnings reports, to make sure I understand what is expected, what has the trend been for Google, or Tesla, or Amazon, whoever is in charge. So, I am paying attention to the fundamentals there, what the market expects, things like that. I pay very close attention to the news, events, economic releases, yield curve. That kind of things. But I still have to see the price action before I get in. The trade still has to meet my requirements. The market is kind of the same. So, if you are shooting a rocket, trying to hit a point a mile away, you have to point the rocket in the right direction and give it the right amount of energy to get it there. As the market moves around and advertises prices, we see collisions, we see these dots, we see the size on the heat map, and finally, the market interacting with these signs. I see that almost as physics. That helped to organize the information in my way. With that being said, there isn’t one way to organize information. The thing about the market is that there are so many ways to work with it. It just made physical sense to me because of the way I see nature, things like that. So, the biggest takeaway from the engineering background is that I’m comfortable with numbers, with Excel, which was huge. But, can a lawyer or graphic designer learn to use Excel? Absolutely. It’s not really necessary. There is no right way or wrong way to trade. What is your view on the Minsky Hypothesis? Is the market all about the crowd psychology or there are still some participants playing the role (for example, regulators or exchange platforms)? I believe the crowd psychology is absolutely true. For example, nobody talked about Bitcoin and crypto until about the summer of last year when it became mainstream. That is when people notice it and then, by the time it gets so widespread, the smart money should already be moving up. The book that taught me this really defined how I look at risk. I’ll give you a small anecdote. By the time the people who are not related to this business start talking about cryptocurrencies and start wanting to buy one, it’s probably too late. Since many people know I’m in the market, I received many messages on Facebook saying, “Hey, is this a good time?” And I kept telling everybody, “Look, this thing is $18,000 and it is going up at 2-3 thousand a week.” That is not a healthy sustainable market. If you have money you wanna lose, and you don’t mind holding this thing for the next 5 years, then it’s for you. But if you want to make easy money, this is not the place to be. Because when you look at the chart, the darn thing is vertical. So, that is mass psychology at its best. I learned this first hand, by the way, when I first got into trading in 1999. The reason I got into trading and investing is that I was buying and selling Dot-com stocks. I owned Enron until the company was shut down, I owned WorldCom before it got shot down. Because those stocks were just making so much money, and I saw how the top comes in, I was the idiot who was still thinking, “Yes, I’ll keep buying.” So, mass psychology is a big part of this. Do you believe that HFT will replace click trading? I know that the background behind Bookmap is the expertise on HFT and algos, but there is a misunderstanding here. Most people think the market is controlled by computers and it’s true from a statistical perspective. That is because if you take a product like the S&P 500 and execute on a machine using an algo, you have to report that to the exchange for that particular username. I have to report on the tag 50 for that username after reporting the exchange, and this is an algorithmic execution system. All the executions that take place are listed under that algorithmic system that is executing. But here is the thing: I worked with trading systems, with a fund, and I saw how they managed their trade desk. If you are managing a huge position, you would be pretty backward. You’d be a dinosaur if you had a person sitting there and executing 10,000 contracts in the S&P or 1,200 contracts in crude oil by going buy 10, buy 10, and so on. But, what they do is they pass this order to a computer, and the computer uses the smart algo to work that order in the market. So, that order qualifies as an algorithmic system and the volume for that particular fund or program is algorithmically traded. However, the decision to buy those 10,000 contracts is made by a human being. When people insist 90% of the volume that occurs is algorithmic, I say it’s true. However, it’s like a sewing machine versus your grandma, sewing with her needle. It makes no sense. So, basically it’s a progress, but made by humans and we have to embrace it and understand what is going on with the market. Yes, and here is the caveat: you are going to be severely adversely affected, in my opinion, if you are sitting there scalping for ticks. You are paying the inside bid, inside offer, you are trying to be a market maker. That is what I was. That game is done. Computers do it much better. There is a size in the book that you don’t even see and it’s trading. However, if you expand your time horizon, which I had to, you start looking at the trend, analyzing it, and you are not really affected that much by what algos do. I don’t look at the heat map once I put the trade on. It just starts to make me anxious. I just go back to the chart that I’m trading off of and I don’t care what these algos do. The trade is either gonna work or not. That’s different than AI. AI is scary on many levels. It’s basically replacing the human-decision making process in many fields, including the market. But, if somebody is able to program a car to drive a Volvo down the road with just a high-speed computer, then they are probably able to follow what I’m doing and do it better and quicker. At that point, maybe I’ll have to become some sort of a programmer, but as it sits right now, like how the AI system responds to X or Y, or a Trump tweet, or sanctions against Russia, or sanctions against China, I have no idea. In the market, as it is right now, I believe you can make money being a discretionary trader, I see it every day and it works. When it stops working, I’ll have to go find something else. However, this threatens many industries. OK, so since about 2010-2011 what I wanted to do was to come back to prop trading. However, at the same time, I saw that I was very interested in what was going on online, so I became fairly active online by accident. I did a lot of webinars myself and gained a big following. Could you please define for our audience what a prop trading is? Prop trading is defined as hiring somebody who becomes an actual official employee of a firm. The firm puts 100% of the risk capital, owns 100% of the account, the equipment and everything else, and the employee’s job is to use firm’s resources to extract profits from the market. In return for these profits, the firm takes all the risks, and the trader gets up to 80% of the net profit at the end of the month. What I’m doing now with Convergent is I try to create this environment virtually. The chat room is split into channels, each channel is being treated like a room within a prop shop, so in global indexes you only talk about global indexes. That’s the first phase. The second phase is the Convergent trader program. Basically, it’s a program where I would put new traders through, so that when they finish the program, they have a standard level of knowledge and a way of looking at the market. Once people go through the program, the goal is to use the tool to monitor people’s performance trading and to look for the talent and offer that talent a proposition. Why do that? That is because you can own a 100% of a $1,000 of profit or you can own 50% of a $50,000 of profit. With prop you get the leverage, you get the exchange, membership rates, you trade a cost, and at the end of the month we look at your net result and you get paid whatever that net result is. Same thing I did physically at the Board of Trade in Chicago, but I wanna do it virtually. to somebody who has strong potential. Right now we are still in a community building phase, so it’s all about a chat room that operates efficiently and properly, and continuing education. Every week I’m doing a webinar, at least once or twice a week, and this is open to everyone at this point. It’s about a place where you can get a good quality information from people who actually care. Looking back at your trading experience, do you have some regrets? If you could go back in time, would you change anything? I don’t believe I have regrets. I mean, the progression that I went through as a trader is my path, I own that path, so I don’t think there are regrets. I’ve done a lot of dumb things trading. I tell people my worst losing trade ever was a 40 second $56,000-$300,000 loss. I can’t even say I regret that trade. I was trading at DAX after the European close, the market was rallying to the resistance point, I shorted the resistance point, it started pushing slowly, so I added and added. I ended up holding 42 contracts short and the DAX is continuously pushing up. It was in 2004 and I had no plan for the trade, no risk management. So, I don’t think I really regret it. There is one of the things that I haven’t done but I wish I have, and that is learning how to program. This is a huge weakness that I have and I would love to have control of, not having to do it for me. Also, I should’ve learned statistics a lot sooner, but overall I’m in deep gratitude every day about where I am and the opportunities that I’ve lost, as well as the opportunities I’ve received. That’s really important to me, and if I change the life of just one person, that is huge. Money comes and goes. I’ve been divorced, lost a lot of money. I remarried, and I’m doing OK now. So, how you have an impact on other people is supremely important, because nobody is going to remember Steve Jobs and how big his house was, or the billions he had, but people will remember the impact that his product had on their lives. That is what is important to me and that is what I have gratitude for. Morad, we are going to shoot three blitz-questions. You may comment on them really quickly. So, many people consider it as a trading system. I don’t think that is a good approach. I disagree with that approach. Order Flow helped me localize a better execution, a better fill, a better edge, a place that is closer to my stop than it would without it. So, if I engage with the market, I wanna use whatever tool I have that gives me a better place to enter. That’s the limit of what Order Flow can do. It’s like putting fingers on someone’s pulse and feeling how strong it is. I’m indifferent to it. I mean, I’m just out there. I don’t think it has an impact on who I am. First of all, in this business [trading], you have to be well-capitalized. Without capital you have zero chance. I mean, if you are paying a college degree, you wouldn’t expect to get a good one for a $1,000 or $2,000. It’s just not gonna happen. Secondly, it’s best to know that all along your job is to determine for yourself what your particular approach to the market will be. Do not adopt someone else’s approach and expect you are gonna have the same results. Many gurus have said this, and I will concur with this. You duplicating my trades isn’t gonna make you any money in the long run. You have to understand how the market works and make it work for you. That’s very important. We are grateful to Morad for this deep interview. We believe that traders, both professionals and those who start trading endeavors, found something new and valuable for themselves. The site of FT71’s prop shop community Convergent Trading.